You're reached final week of Healthy Heroes 5K Challenge! You've almost reached your goal! With the completion of Week 7, you're now going into your eighth and final week of the eight-week training plan for the Healthy Heroes 5K Challenge. You've gradually built up from short runs to extended runs and are nearly prepared to tackle your first 5K for the Healthy Heroes Run & Walk on Saturday, Sept. 8, in Sioux Center. If you haven't registered yet for the Healthy Heroes 5K, you can still do so online at AllSportCentral.com. Finish your training strong with the Week 8 plan that nurse health coaches Stephanie Van Ruler and Kim Davelaar of Promise Community Health Center have prepared for you. for the Healthy Heroes 5K Challenge. Day 1: Run 30 minutes. Day 7: Run 15 minutes / Walk 10 minutes. Just like you, Stefenie Smith of Rock Valley has completed the first seven weeks of the Healthy Heroes 5K Challenge and is ready for eighth and final week. Nurse health coach Stephanie Van Ruler gets her started on the week's training plan. 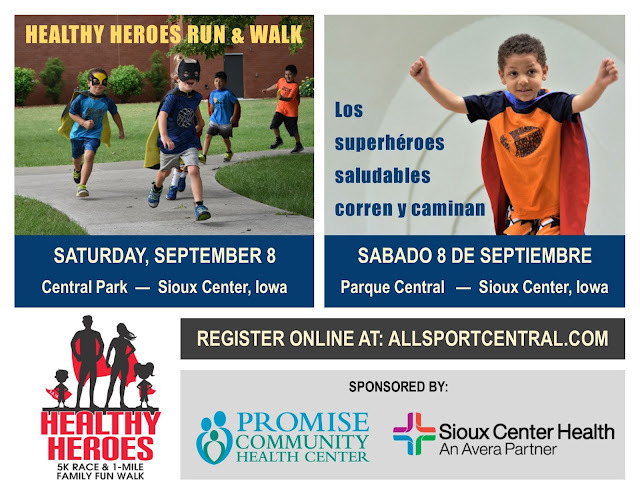 Promise Community Health Center and Sioux Center Health are partnering together to put on a Healthy Heroes Run & Walk on Saturday, Sept. 8. Join in on a 5K Race or 1-mile Family Fun Walk. You still have time to register online at AllSportCentral.com. For more information, read this preview story. Gather family and friends to participate in this fun event. Choosing health is a superpower! With the completion of Week 6, you are now three-quarters of the way through your eight-week training plan for the Healthy Heroes 5K Challenge. Nurse health coaches Stephanie Van Ruler and Kim Davelaar of Promise Community Health Center are moving you closer to your goal of running your first 5K for the Healthy Heroes Run & Walk on Saturday, Sept. 8, with their customized plan. If you haven't registered yet for the Healthy Heroes 5K, do so soon. This Saturday, Aug. 25, is the last day that you can sign up at the early-bird discounted rate. Register at AllSportCentral.com. Now it's on to Week 7.
the Healthy Heroes 5K Challenge. Day 1: Walk 2-3 minutes to warm-up / Run 25 minutes. Day 3: Walk 2-3 minutes to warm-up / Run 15 minutes at a faster pace. Day 6: Walk 2-3 minutes to warm-up / Run 27 minutes. Next week, we'll be back for the final week: Week 8. Just stop back at promisechcnews.blogspot.com for the training plan. Just like you, Stefenie Smith of Rock Valley has completed the first six weeks of the challenge and is ready for Week 7. This week, Stephanie Van Ruler gets her started on the week's first day activity. Each week, you will see a new video as Stefenie starts a new week of the challenge. 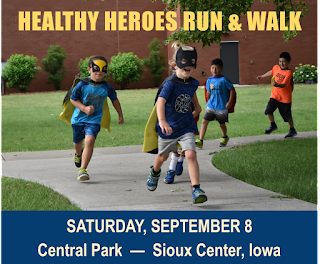 Promise Community Health Center and Sioux Center Health are partnering together to put on a Healthy Heroes Run & Walk on Saturday, Sept. 8. This Saturday, Aug. 25, is the last day that you can sign up at the early-bird discounted rate. Register at AllSportCentral.com. For more information, read this preview story. To register, visit www.AllSportCentral.com. SIOUX CENTER – Promise Community Health Center of Sioux Center seeks nominations for this year’s Addink Community Service Award. The deadline to submit a nomination is Sept. 15. The award will be presented during Promise Community Health Center’s 10th annual “An Evening of Promise” Celebration and Fundraiser on Thursday, Oct. 18, at Terrace View Event Center in Sioux Center. The honoree will be notified prior to the event and will be recognized publicly. To fill out an online nomination form, visit this link. For a paper form, click here. To have a nomination form emailed or mailed to you, contact Derrick Vander Waal at 712-722-1700 or derrick@promisechc.org. For more information about the award, read the full criteria here. Promise Community Health Center’s 10th annual “An Evening of Promise” Celebration and Fundraiser is slated for Thursday, Oct. 18, at Terrace View Event Center in Sioux Center. The event will feature entertainment by comedy mentalist Arthur Fratelli, a catered dinner and presentation of the Addink Community Service Award. Ticket sales will run through Oct. 10. To purchase tickets online, visit promiseevent2018.eventbrite.com. SIOUX CENTER – Promise Community Health Center of Sioux Center was recognized as a leader among its peers nationwide in delivering high-quality, comprehensive care. The U.S. Department of Health and Human Services announced that Promise has been awarded $70,500 in federal grant funding to recognize quality improvement achievements in the past year and enhance future improvement efforts. Promise was among 1,352 federally qualified health centers nationwide awarded $125 million as an investment in quality improvement. 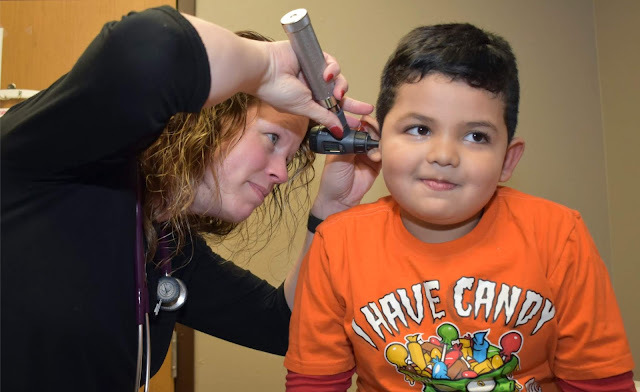 Iowa’s 14 community health centers were awarded more than $1.3 million. achievements in high-quality care to patients. The grant awards were announced during National Health Center Week, which was Aug. 12-18. “These Quality Improvement Awards show the hard work of staff from all of our teams,” said Amy McAlpine, data and compliance specialist for Promise. 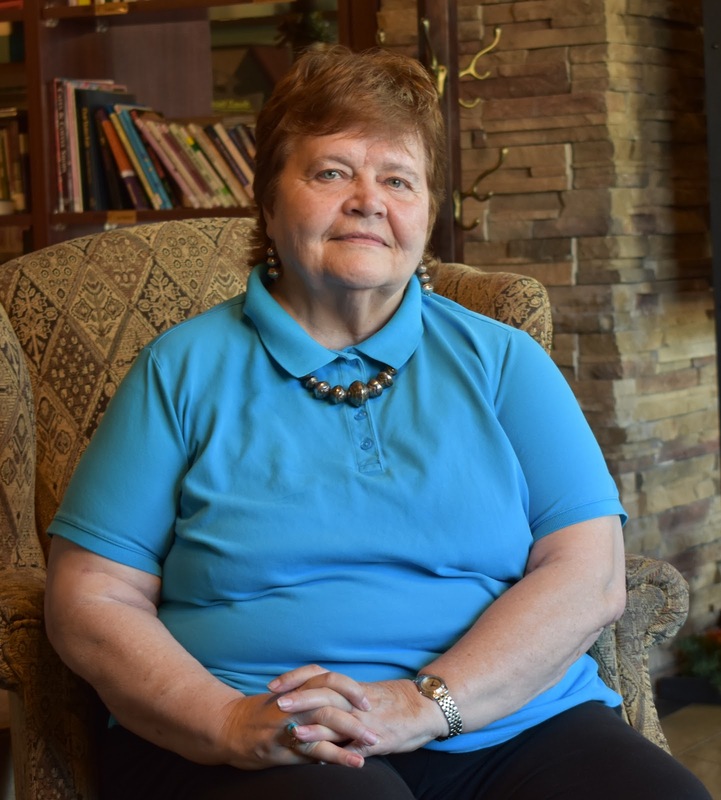 “Every year, we work hard to make specific improvements in our care. We want to provide the best care for our patients – we want it to be high-quality, cost-effective and a good experience for the patients and care teams. $19,750 for Health Center Quality Leaders. The award signifies that Promise placed in the top 30 percent among health centers nationwide for best overall clinical performance quality measures. Promise improved in 13 of 17 measures during 2017 to boost itself into the category. Eight of 14 community health centers in Iowa received the award. “This is significant because it shows that Promise is not only about making sure everyone can access care but that it is also very high-quality care,” McAlpine said. $15,750 in Clinical Quality Improvers by demonstrating notable improvement in one or more clinical quality measures in 2017. Twelve Iowa health centers received the award. $15,000 in Addressing Health Disparities, signifying that Promise met, exceeded or made considerable advancement toward Healthy People 2020 goals across different racial/ethnic groups. Six Iowa health centers received the award. $10,000 in Enhancing Access to Care by increasing the number of patients served and the number of patients receiving comprehensive services. Seven Iowa health centers received the award. $5,000 in Electronic Health Record Reporters by employing EHRs to report on all clinical quality measures data for the health centers’ patients. All 14 Iowa health centers were awarded. $5,000 in Advancing Health Information Technology for Quality, recognizing the use of HIT systems to increase access to care and advanced quality of care. All 14 Iowa health centers were awarded. Promise is part of a network of nearly 1,400 community health centers nationwide that serve more than 27 million people at more than 11,000 sites. During 2017, Promise cared for a record 4,750 patients – 22.4 percent more than the previous year. 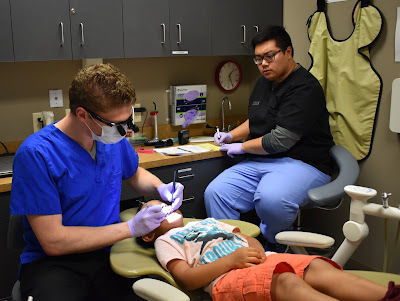 Those patients received a comprehensive range of services that included medical, prenatal, dental, vision/eye, behavioral/mental health and family planning – all under one roof. Of those patients, 44.3 percent were on Medicaid, and 36.4 percent had no insurance. You've finished the fifth week of the eight-week training plan for the the Healthy Heroes 5K Challenge. 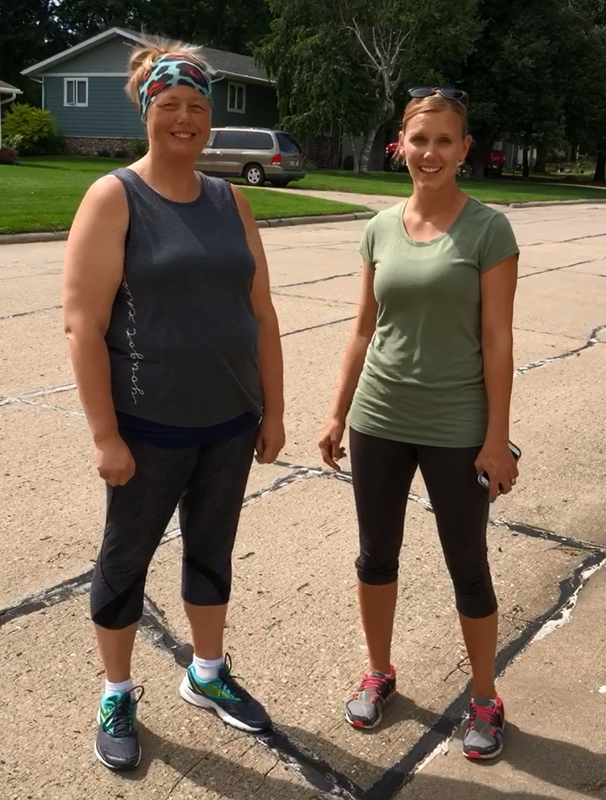 Nurse health coaches Kim Davelaar and Stephanie Van Ruler of Promise Community Health Center are gradually increasing the distance you run in their customized training plan so that you can reach your goal of running your first 5K for the Healthy Heroes Run & Walk on Saturday, Sept. 8. Now it's on to Week 6. Next week, we'll be back for Week 7. Just like you, Stefenie Smith of Rock Valley has completed the first five weeks of the challenge and is ready for Week 6. 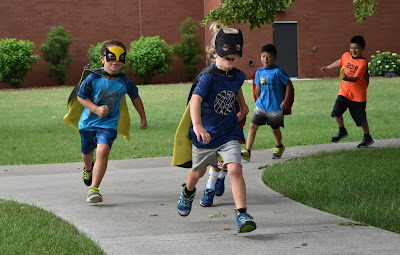 SIOUX CENTER – Dress up as a superhero and go for a run or walk. Healthy Heroes Run & Walk on Saturday, Sept. 8. To register online, visit AllSportCentral.com. ﻿The 5-kilometer race (3.1 miles), which will be timed with chip technology, is slated for 8 a.m. The free Family Fun Walk will start at 9:15 a.m. Participants for both events are encouraged to register in advance at AllSportCentral.com. Runners who register by the early-bird deadline of Saturday, Aug. 25, will receive a discount and will be guaranteed an event T-shirt. Everybody, no matter their fitness level, is encouraged to attend. The timing and purpose of the event is to promote healthy lifestyles. Van Ruler said they selected a date in September during National Childhood Obesity Awareness Month because they wanted to promote awareness about the dangers of childhood obesity and the positive effects of wellness for both children and adults. organizers for the inaugural event. Therefore, the event will more than just a run and walk. It will be a full-fledged health fair. Several community organizations will have booths at the event with a wide array of educational, interactive and fun activities for the whole family – ranging from storybook walks to superhero photo booths. “We want to give people the tools they need to start moving and having healthy habits as a family,” Van Ruler said. Fitting with the theme, participants in the run and walk are encouraged to be creative and dress up as a superhero. A prize will be awarded for the “Best Dressed” superhero costume. Visit AllSportCentral.com to register online for the Healthy Heroes 5K Race / 1-mile Family Fun Walk. The registration fee for the 5-kilometer run will be $25 through Saturday, Aug. 25. The cost then will increase to $30 through Friday, Sept. 7. The walk-up fee on the day of the race will be $35. Runners 10 and younger are free. An event T-shirt will be included with the 5K registration. Register by Aug. 25 to guarantee shirt availability and size. For those who have a financial need, All Kids Can will assist will the registration cost for families that qualify. To apply, visit sc-akc.com. The 1-mile Family Fun Walk is free, but participants are encouraged to register in advance at AllSportCentral.com. Note the special instructions about how to register for the walk on the website. An event T-shirt will be available for purchase. For more information, call Stephanie Van Ruler or Kim Davelaar at 712-722-1700 at Promise Community Health Center or Krystal Vander Pol at 712-722-8414 at Sioux Center Health.